Wednesday Instructs include an intrasquad game in Bright House Field. 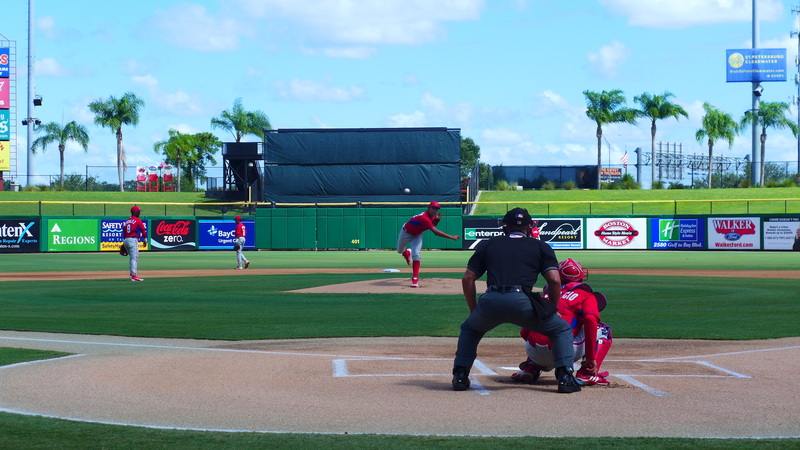 Today’s game offered the added incentive that Kevin Gowdy would return to the mound after taking a ground ball off the forearm of his throwing arm. 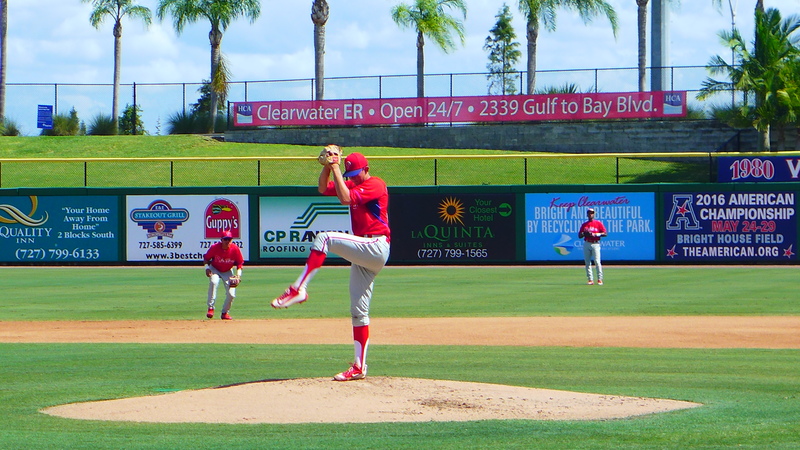 Arrival at the park brought the added surprise that Mickey Moniak was in uniform and scheduled to play three innings in center field. We scored a prospect “hat trick” when our much heralded 2016 top international signee, 16-year old RHP Francisco Morales, exited the bullpen to pitch the “home” first. 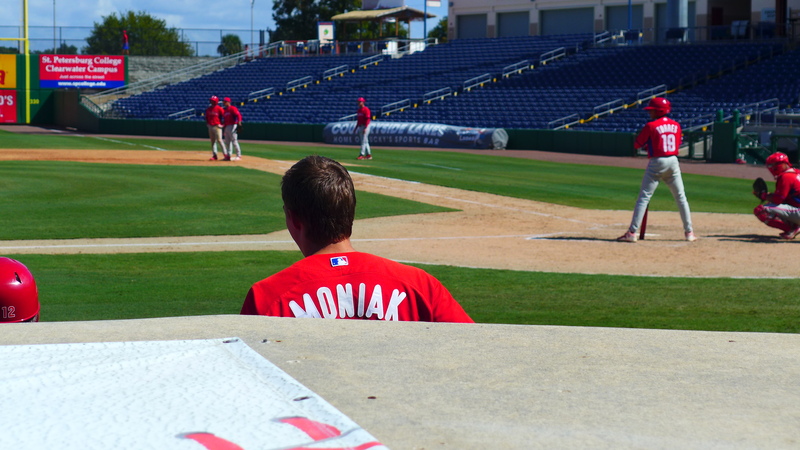 He would face Moniak as his second batter. Both line ups were littered with 2016 draft picks and international signees – Cole Stobbe,Josh Stephen, Aaron Brown, David Martinelli, Brett Barbier, Jonathan Guzman, Juan Aparicio, Brayan Gonzalez, Nicolas Torres, Jose Tortolero, Simon Muzziotti, Keudy Bocio, Jesus Henrique – as well as Jhailyn Ortiz, “C” Randolph, Luke Williams, Edgar Cabral, Rodolfo Duran, Malvin Matos, Joey Curletta, and Greg Pickett. They only played 7.5 innings. That’s when they had used up all the available pitchers for the day. Morales and Gowdy each pitched one inning. Jose Nin, Andrew Brown, Jesus De Los Santos, Sandro Rosario, Denny Martinez, and Rafael Carvajal pitched two inning each. Gustavo Armas pitched the final half-inning. I don’t have the play-by-play, but I have a lot of pictures and video. Francisco Morales warming up – pitch 1, pitch 2, pitch 3. Morales records his first out. Another batter tries to kill the camera guy. 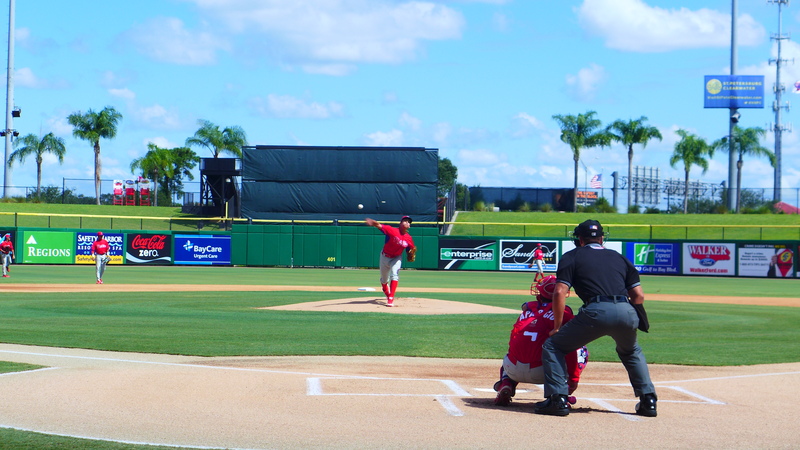 Morales first pitch to Moniak. The other 5 pitches of the at bat – pitch2, pitch3, pitch4, pitch5, pitch6 a ground out to second. Morales retired the side in order – a pop up, ground out, and strike out. He didn’t pitch a second inning. I checked with the guys charting his pitches. Morales’ FB was 92-94, mostly 92 mph. To tell you the truth, I was surprised he registered that high. His delivery looked so motionless and he didn’t pop the glove. But, 92-94 mph from a 16-year old isn’t shabby. Five more pitches from Gowdy’s inning – pitch2, pitch3 a strike out, pitch4, pitch5, pitch6. Gowdy should have had a a conventional 1-2-3 inning. He struck out the first batter. The second batter reached on a fielding error by the shortstop, he let the ball roll under his glove on a slow roller behind the mound. 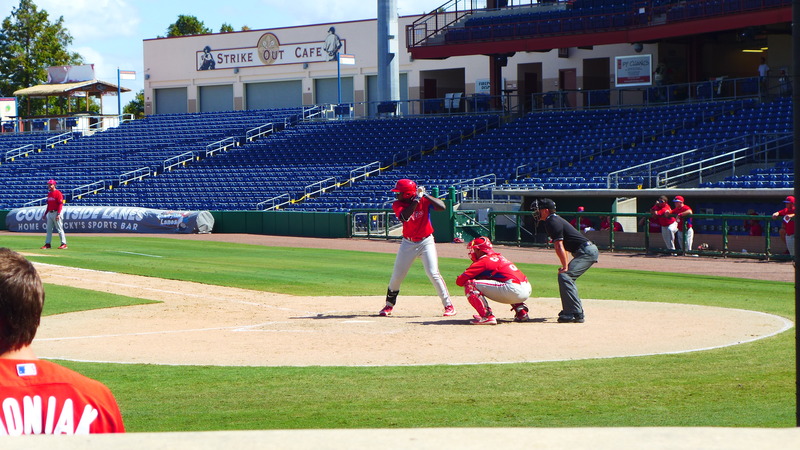 He struck out the next batter while the base runner (catcher Juan Aparacio) stole second base. There was a slight collision at the bag and the ball sailed into center field. Aparacio went to third. After the ball was retrieved, Gowdy’s team appealed the play at second. Aparacio was ruled out for not touching the bag. Gowdy did not pitch a second inning. But he had 2 K and a caught stealing. Sorry, no velocity. Mickey Moniak was in the on deck circle in the third inning when the final out was recorded. He was removed in the fourth, so he only had the one at bat, a ground out to second. His only play in center was throwing the ball back in on the over throw on Aoparcio’s “steal”. Greg Pickett had 2 hits, a line drive single to right and a HR that barely cleared the fence in right (into a fairly stiff breeze). Rosolfo Duran had an RBI double. Luke Williams lined a 2-run HR to left, also into a stiff breeze. Here are some random photos and video. Jhailyn Ortiz. He’s been hitting the ball sharply, but at fielders. Randolph in his only at bat. Randolph doubles, he swung at the first pitch. I almost missed the shot. Infield single by Josh Stephen. Foul ball by Greg Pickett. Pickett’s HR, much better swing. I lost the ball off the bat. It just cleared the fence. The coaches in the dugout questioned whether it was on the grass or on top of the cushion in play (ground rule double). They had one of the pitchers go get it. They were still discussing the landing point until the pitcher picked the ball up off the berm. 10/10 – Jimmy Paredes elected free agency. 10/10 – Patrick Schuster elected free agency. Jim, awesome stuff. A 16 year old throwing 92? Wow, that’s impressive. He could easily get up to 96-97 by the time he’s 19. Good to hear that Gowdy and MM both are back on the field. Pickett keeps hitting it seems. Murray – there have been reports of Morales touching 96. Indeed exciting. I believe he turns 17 this morning so I would expect to see him in the GCL next season. Greg Pickett seems to be on fire. Good to see after a rough season. I am not quite seeing all the earlier concerns about Morales’ delivery, mechanics and follow-thru….especially from a 16-year old. He looks well advanced for his years in all areas. I can see some issues with his delivery. He keeps his back curved slightly through the delivery. Pickett is a big boy isn’t he…. Jim Thank You for saving this site! It looked like there was a chance it would fold. You hoisted it up on your shoulders and carried it to the top of the mountain! Almost a daily read for me! Thank You! 92-94 from a 16 year old is unreal. Heck, even from a 17 year old it is top notch — Morales turns 17 in two weeks, on October 27th. 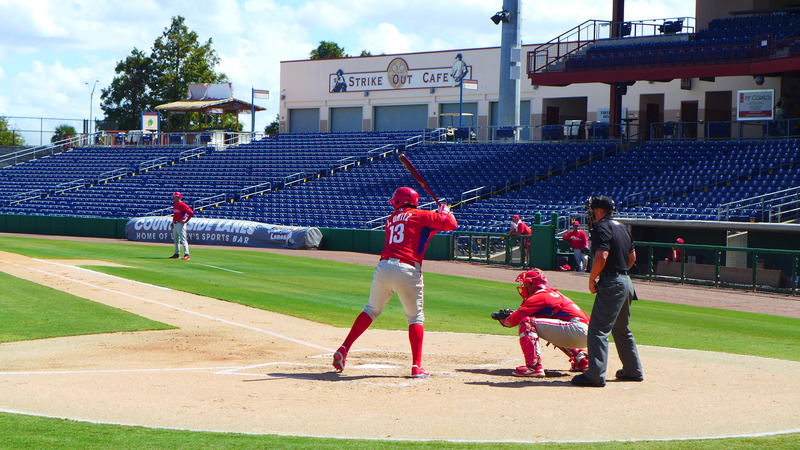 Man, the Phillies representatives in the AFL have been awful so far in three games. Ain’t that the truth. 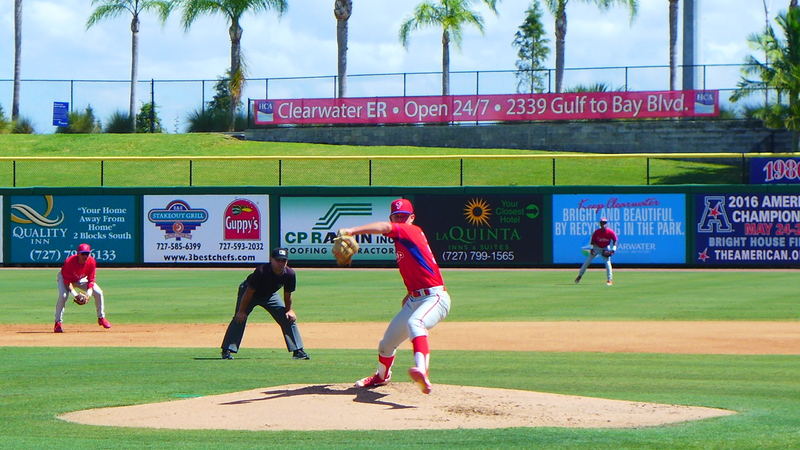 I just watched Scott Kingery hit four fly balls today. And Walding looked less than wow. 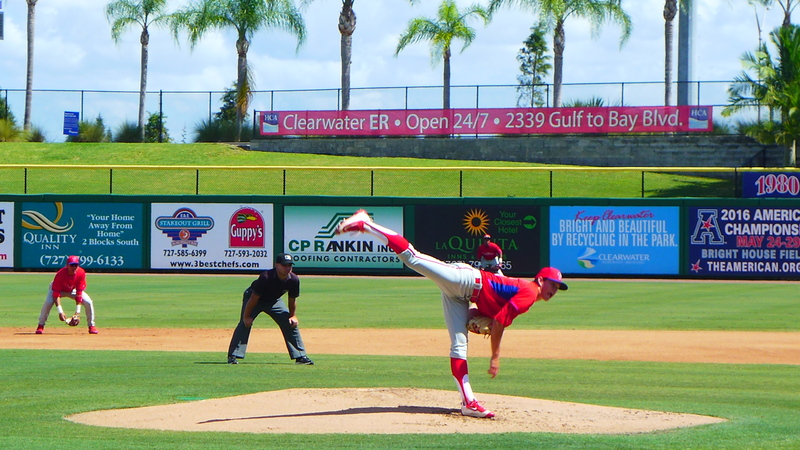 Jeff Singer looked good in his 1 inning of work. Victor Arano did not. I came down pretty hard on the Mets for sending Tebow to the AFL but Philly did a similar thing sending Singer there. Singer was in the Independent Leagues a year ago. He had a very nice start in Wmsprt and LKW this year and finished in CLW. He wasn’t as good in CLW but it earned him a trip to the AFL. I realize that he has innings left in his arm and there is a remote chance of him becoming a major leaguer but did it warrant a trip to AFL. Tebow was strictly a publicity stunt and Singer has none of that but still who can defend the Singer choice? Oh my gosh, it’s entirely unfair to compare Tebow to Singer. Tebow last played baseball in middle school and has no background as a baseball player and is in his late 20s as a hitter – I don’t think there is ANY historical precedent for a position player this old first starting out in professional baseball and making the major leagues. He has done nothing in baseball to earn that type of promotion at this time. Why they sent him there is anyone’s guess, but his experience alone did not merit this promotion and if his name were not Tim Tebow there is zero chance he gets sent to the AFL this year. Singer is an entirely different story and he’s a hell of lot younger than Tebow. He’s actually a baseball player and always has been. Singer is a classic late bloomer, who, as a college pitcher threw around 90, but now sits in the mid-90s as a lefty, touch as high as 99 MPH (see that attached article). Lefties who throw 99 are a rare breed. He’s a legit prospect and the type of guy that the Phillies often send to the AFL, much as they did several years ago with Jake Diekman. Singer is a guy who really might have a future as a big leaguer and it’s not fair to group him with Tebow. Will he end up making it in the long run? Who knows? But he absolutely has earned this shot. Here’s the article – he’s no Tebow. I won’t even knock the Mets for sending Tebow although I think his signing was simply a way to sell minor league tickets. IF they are serious about him becoming a major league player then he’s going to have to be fast-tracked through the system and needs as much playing time against advanced competition as possible. Facing teenagers in instructional league isn’t going to make that happen..
At age 29, he had better be playing in the majors within the next 2 years or they are wasting their time.. He has lost so much development time that it’s insane. If Tim Tebow makes the major leagues it would be astonishing. I think, to do that, given how much time and instruction he has lost, he would have to have the raw abilities of a Hall of Fame type player. Otherwise, I don’t think he has a prayer. When you get to a certain age, especially for a hitter, you really cannot make up the lost development time. My favorite example of the effect of this lost development time is the case of Jose and Ozzie Canseco. Jose was drafted by Oakland out of high school and became a huge star. Jose’s identical brother, Ozzie was drafted by the Yankees (I believe) and, for some crazy reason, even after Jose became a big star in the majors, the Yankees somehow never connected the dots and kept him as a pitcher. Oakland then acquired Ozzie and immediately converted him to a position player. That conversion process started when Ozzie was only 22, but it was too late. Although Ozzie made it to the majors briefly, he never hit a major league home run. So it’s almost silly to think that, at age 29, Tim Tebow can come out of nowhere and become a major league player. Catch, I agree that the signing of Tebow makes absolutely no sense simply based on age. Add in the years of missing time away from baseball and there is no way this works. My only point is that if the Mets think it’s going to work, Tebow is going to have to compete against at least AA level talent starting in 2017 and he needs to progress quickly. He doesn’t have time to play instructional league baseball, in rookie ball, etc. 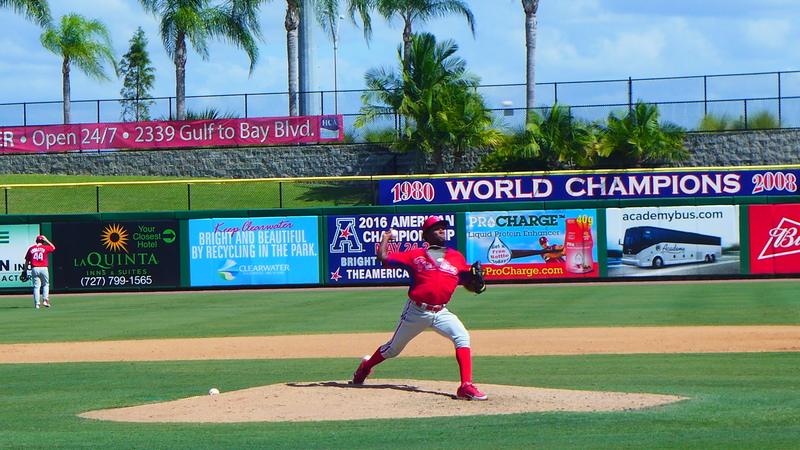 Playing in the AFL is a first step in facing advanced pitching. He will have to be a truly unique talent that can transcend logic. I don’t see it myself by maybe the Mets do.. I laugh because the Mets have, historically, been such bad judges of hitting talent. I grew up a Mets fans and my family still lives near NY and are Mets fans. Yup – they wouldn’t know a hitter if one landed on them. Lee Mazzilli…..Lenny D……Mookie..and not Betts. I missed Lenny – you are right about that. Mookie was a good player but just an okay hitter. Lee Mazzilli was just average. MItchell’s career was short but he could hit; same with Alfonso. Good points – I should have remembered Mitchell and Lenny. Hundley had one great season and for his career was not a good hitter or player. 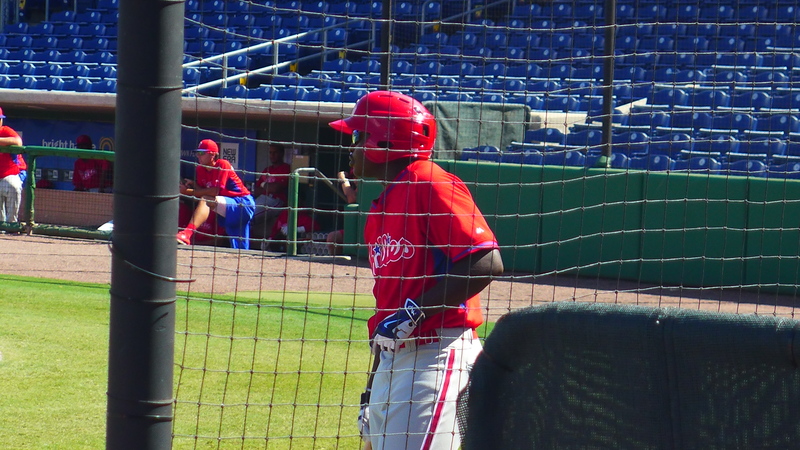 JimP…..like to have your opinion in comparing two Phillies young CFers …Moniak and Muzziotti. You have seen them up close and probably can give a more objective evaluation. I have seen their videos and looking at their vitals, they are strikingly similar, though Muzziotti is a little younger, maybe 8 months. Even their swings are similar, or maybe it is just because I am looking at two very lean and wiry bodies. Anyway, what do you see as each of their projections going forward? why do the Phillies feel they need to protect Araujo and Buchanan on the 40 man?